A word typically dreaded by students everywhere. In today’s times, a student has a set of guidelines to follow of course, but we all know that rules are broken. In the earlier days of MAC, the college expected students to follow its rules and to behave in responsible ways that contributed to the well-being of the college community. Although living away from the over cautious watchful eyes of their parents, the college administration still tried to maintain a strict order and control over the student’s activities. However alcohol, class and organization rivalries, repressive rules (in the eyes of the students), and institutional traditions contributed to quite a rebellious student body in the early days of MSU. Pranks and traditions began ever since the college opened its doors in 1857. As time progressed, these rebellious activities increased and four in particular occurred as annual shenanigans. 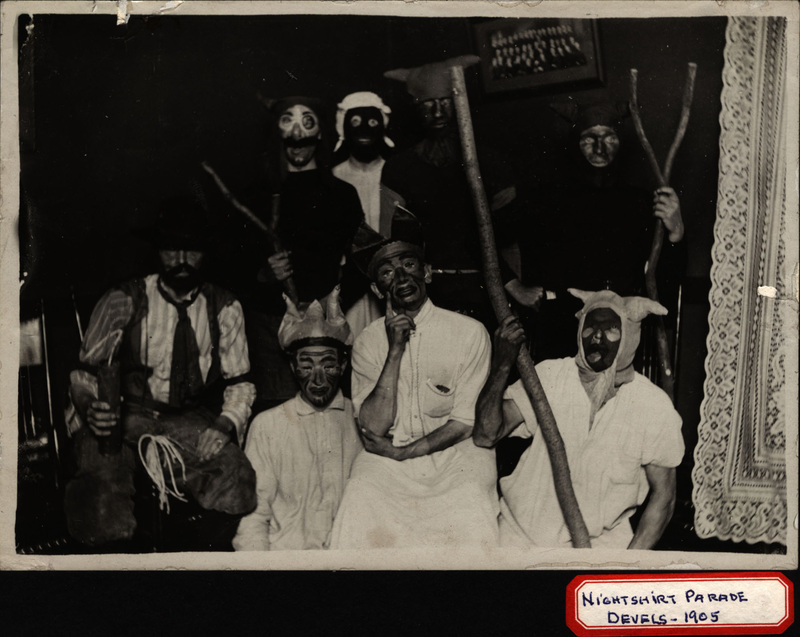 During the 1907 Night Shirt parade, students paraded around the campus either wearing night shirts or dressing in other unsightly ways and carrying torches. They visited the faculty houses and expected them to respond with a speech. On the way back to their dormitories they smashed lights, broke windows, and vandalized doors as other students who stayed in dumped water out of their windows on the paraders down below. The annual scrap was always looked forward to by many students. Despite the plea of the faculty to the upper classmen to not hold the event, the happenings occurred any way. The rush or scrap was a bought between the freshman and sophomore men that intended to show which class was superior. Often times, these scraps would end with a wrestling match to see which class would come out victorious. The J-Hop dance was another event that provoked pranks. It was a tradition every year for the sophomore class to tamper with the electrical wires to short out the electricity, leaving the back-up gasoline lamps the only means of lighting. In 1906, this prank almost got out of hand as someone else had constructed an apparatus under the Armory to produce enough hydrogen sulfide gas, in chemistry professor Frank Kedzie’s opinion, to have killed everyone in the building if the machine had been activated. In addition to these pranks, there was one more annual shenanigan that occurred every year to members of the freshman class. “Stacking” as it was called, was one of the number of indignities that the freshman men had to endure. As part of their college initiation, their rooms were “stacked”. 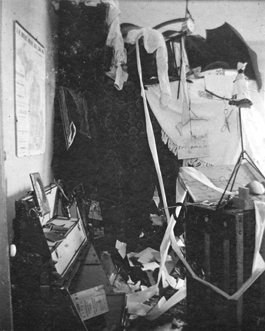 Gordon Stuart, a student of MAC at the time described the experience: “I send you a photograph of my room as it looked one night when I came back from class. Every freshman must have his room “stacked” by the sophomores, so my turn came in due course. They climbed over the transom and literally stacked everything in one corner of the room. Every garment had at least one hard knot in it, and some of them two or three. Over a thousand stamps I had collected, which were loose in a box, were scattered over the whole room. Six packs of playing cards were also thrown in the “stack”. My tooth-brush was put in the water-pitcher and coal oil was poured over it. Nothing but the map on the wall was left in its place. The stackers hung out a sign from the window, “Stack.” Of course, every student saw the sign and came up to see how the room looked. It was past twelve o’clock that night before I got my bed down so as to sleep on it. The “stacking” is not done with any malicious intention; only for fun and pastime”. It was not only boys however who acted rebelliously. In January of 1903, Gertrude Peters (class of 1906) received permission to spend a night with a friend in Lansing. Well naturally, rather than staying true to her word, she had an eventful night as she committed a host of violations. Peters never had the intention of staying with her friend. Rather she went and ate dinner with a man in a restaurant, attended a sleigh ride party, went to Williamston for a dance, and went to a party, returning back to campus between seven and eight in the morning. Her actions unfortunately lost her all social privileges. Other women would also commit violations as they would often leave through the back door of the Women’s Building, or “coop” as it was commonly known as by students, and attend parties off campus at night. Work Cited: Widder, Keith R. Michigan Agricultural College: The Evolution of a Land Grant Philosophy, 1855-1925. East Lansing, MI: Michigan State UP, 2005. Print. Posters from the class rivalry between the freshmen and sophomores are now on our Flickr Page. The class rivalry was a contest between the freshmen and sophomore classes intended to show which class was superior. These contests started out as brawls. In November 1898, the freshmen, coming out of a class meeting, were met by the sophomores who dunked them in the Class of 1883 Fountain. The freshmen closed ranks, forming a “flying V” with the largest man at point and plowed through the sophomore ranks. Parents complained, but MAC President Snyder, who witnessed the action, told the parents not to worry that it was not really all that serious. However, a newspaper report said that three students were trampled and one was knocked unconscious. As class sizes grew these battles became quite violent and participants were subject to some serious injuries. In 1902 students were directed to not hold the annual rush. The classes did not want to be denied the ability to participate in a campus tradition, so they went off campus to settle the matter in a “brutal and fierce” battle. The upperclassmen intervened and convinced each side to select a few men to settle the battle with a wrestling match. However, as a result of the breach of discipline, 17 students were suspended. The students went on strike for several days until the administration agreed to have the State Board of Agriculture review the suspensions. At that point Chester Brewer, director of Physical Culture stepped in. Brewer revised the contest to be more carefully regulated. Victory was earned through points accumulated by winning various contests. Among the contests held were tug of war in the Red Cedar River, football game, flag rush and wrestling. Where the old informality persisted was in the posting of insulting invitations to class rush. When sophomores put up their insulting posters egging on the freshmen, either freshmen or juniors might intervene. Sophomores would also chase freshmen who tried to put up their own posters. The tensions between the classes would often carry over into the next year. When the Junior class held their annual J-Hop (Junior Hop) anonymous sophomores would attempt to disrupt the festivities. In 1904 a pig was introduced to the dance floor, and in 1909 the street car rails were greased on the hill leading up to campus. They also shorted out the electrical wires in 1906 and only backup gasoline lamps prevented the event from being cancelled. Someone constructed an apparatus and placed it under the Armory that could produce enough hydrogen sulfide gas to kill everyone in the building if it were activated. The device was found before the dance and suspensions did occur because of that event. We hope you enjoy these class rivalry posters. They are among the staff favorites in the archives. If you have suggestions of other materials you would like to see us put online, please let us know.